This article, about our dojo advisor Art Ishii sensei of Little Tokyo Dojo in Los Angeles, CA, was initially published on January 2, 2014 as original content for Discover Nikkei, a global online resource for Japanese emigrants and their descendants. Discover Nikkei is a project of the Japanese American National Museum. Art Ishii began his judo training in 1954 at Hollywood Judo Dojo in Los Angeles, CA, under the direction of senseis Takashi Kikuchi, Frank Emi, Art Emi, Frank Watanuki, and Gene LeBell. Upon his induction into the Air Force in 1962, he was sent to Sheppard AFB in Texas. 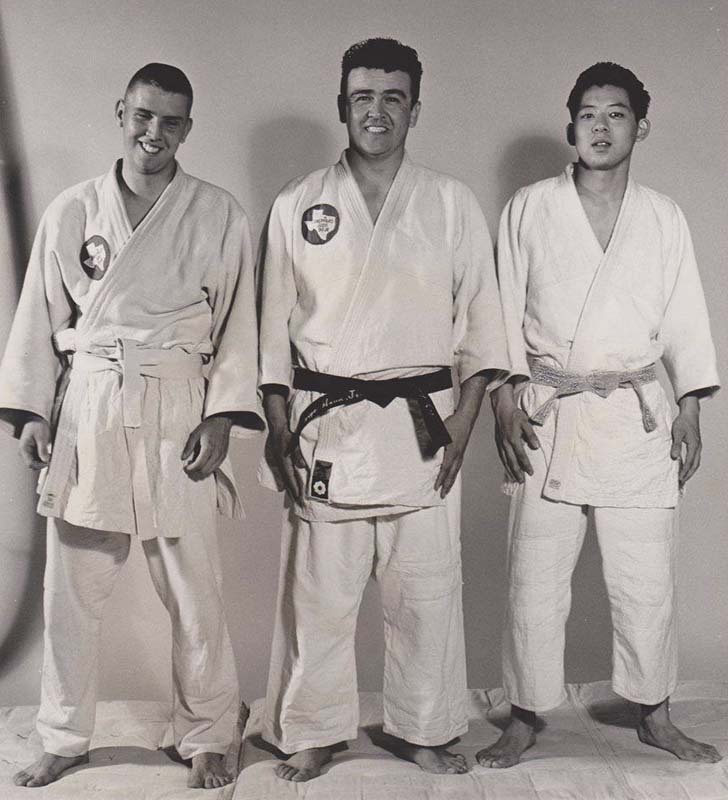 Art Ishii (right) with Sheppard Air Force Base Judo Club teammates, early 1960s. Photo courtesy of Art Ishii. He continued to train at Hollywood Dojo whenever back in Los Angeles on leave, and despite medaling in Air Force tournaments, remained nothing more than an “anonymous brown belt” in his home dojo. 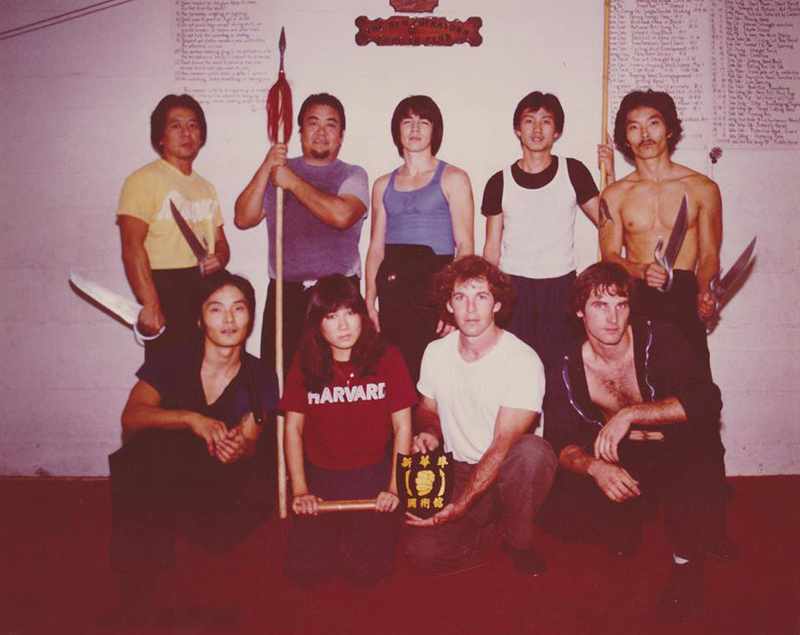 Art Ishii (second row, left) with the New Chinatown Gung-Fu Club, under the direction of Randy Williams Sifu (second row, center), early 1980s. Photo courtesy of Pete Farino. After the military, Art trained in Wing Chun for a number of years at the New Chinatown Gung-Fu Club under Randy Williams Sifu, an LA Chinatown native who today, having apprenticed under such notables as George Yau Sifu, Augustine Fong Sifu, and Ho Kam Ming Sifu, leads the Close Range Combat Academy, an international Wing Chun Gung-Fu organization. These many years later, the two remain close friends and exchange training at Art’s dojo whenever Randy’s travels bring him back to Los Angeles. Art next trained in Goju-ryu Karate at Tenri Dojo in Boyle Heights, on Los Angeles’ Eastside, with the late Guy Kurose Sensei. Guy, a Sansei (third generation Japanese American) like Art, grew up in Seattle but had attended college at Tenri University in Nara, Japan. While there, Guy joined the karate club under Kenzo Uchiage Sensei from whom he earned his black belt and, unprecedented as an American in Japan at the time, not only became a collegiate kumite (sparring competition) champion, but captained the karate team his senior year. 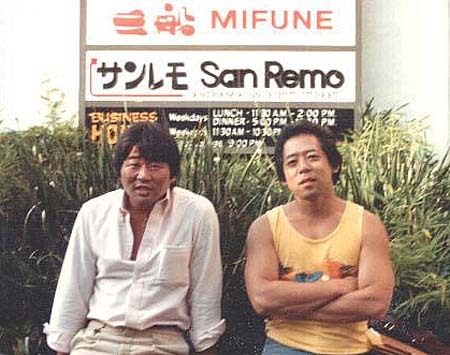 Guy Kurose Sensei (left) with Art Ishii in Los Angeles’ Little Tokyo, mid-1980s. Photo courtesy of Art Ishii. Upon Guy’s return to Seattle, Art was referred to Eihachi Ota Sensei’s Shorin-ryu karate dojo near the intersection of Olympic and Crenshaw Boulevards. A native of Okinawa, Ota immigrated to the United States in 1969 to help a friend run an already established karate dojo, despite his having recently graduated from an electronics college in Tokyo. Passionate for the art since childhood, and having trained for many years under Masao Shima Sensei of Naha City, Okinawa—whose dojo was also well-noted for its kumite—Ota eventually established his own dojo in Los Angeles 1973. Guest instructor Rei Fujikawa Sensei (seated, left) of Shotokan karate, a former team member of Hidetaka Nishiyama’s legendary 1970s kumite team, assists Art Ishii (seated, right) in running a black belt workshop at Art’s dojo in 2012. 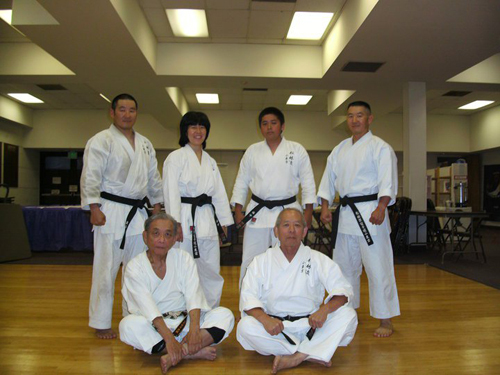 Standing, from left to right, are dojo members Randal Kumagai, Cynthia Nishinaka, Walter Nishinaka, and Russell Kumagai. Photo courtesy of Matsubayashi Shorin-ryu Dojo of Little Tokyo. “My senseis at Hollywood Dojo were remarkable gentlemen of extraordinary character. Their aim in training wasn’t simply to beat people up or choke anyone out, but to bring up a new generation of respectable citizens. This entry was posted in Blog by ravenswoodkarateclub. Bookmark the permalink.